Please congratulate legobuffproductions. He will receive a signed version of the undisclosed pirate set when it comes out in 2015. And obviously the chance to have their name suggestion be the name of the actual LEGO pirate ship… We cannot make any promises, but we’ve been told that the designers REALLY like the name. So fingers crossed! ReBrick is having a "Name the Ship" Contest but what exactly what does this mean? Does it mean a new LEGO Pirate ship is soon to be released? Or maybe even an entire LEGO Pirates Theme? Or something else entirely? Early next year a new ship will set sails on the LEGO waters joining Brickbeard’s Bounty and the Black Sea’s Barracuda in the never ending search for treasure. And do you want to know something really awesome? You can help name it! That is right. This is a contest for finding the best name for a LEGO Pirate Ship. Aye, Matey! On Monday (the 7th of April) ReBrick is launching a contest to find a name for a new LEGO Pirate ship. The contest only runs from April 7th until April 13th. The winning name has the opportunity of being the name of an actual LEGO pirate ship. You have to be signed in to ReBrick in order to participate and you can only suggest five (5) names. These have to be original and cannot have been used before in other commercial relations. The winner will receive the chance to have his or her name suggestion as the name of the actual LEGO pirate ship as well as one of the new LEGO pirate ship sets, signed by the designer. Visit the ReBrick website to enter! Working in every corner of the ship! Does this mean what I think it means? 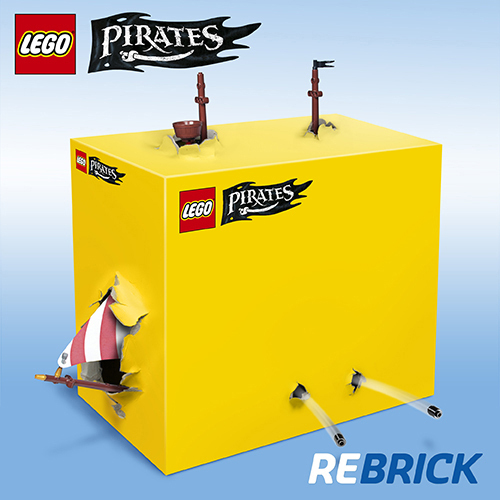 A new LEGO Pirates theme? A new pirate Ship at least... But we shall see! Well look at that! What a pleasant surprise! 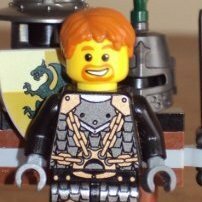 Just when we're thinking about Pirate guilds TLG is thinking of a new LEGO Pirate set! Hmm don't set full sail just yet. As seen here, The Legoland's are revamping some sections. This could be a ship not in a normal set or release but a model in a park and "souvenir polybag sets". I really, really, really do however hope I am wrong! Whatever it is, I'm very excited! Now we just need the blog up and running. That logo looks cool. I hope there's a new theme. 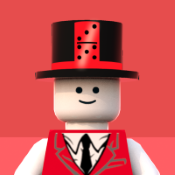 I hope it will be a new theme as well, it seems so since LEGO could just have the creator logo on it if it was just one set. Why would they go through the trouble for just one set and not a whole theme? This year is the 25th anniversary of the Pirates theme, so I was expecting/hoping for a new theme this year. Given how large the set looks (from whats poking out of the box), I doubt it will be a polybag. One of the new? Implying that there's more than one? 2015 is gonna be fantastic. It seems like they would not go to this kind of trouble to release just a one-off set, so my money is that this contest is to kick off a new theme. I am ecstatic with this news! I wonder if there will be winter sets! I hope LEGO has been paying attention for all the fantastic MOC ships that have been posted here on the forum and did a good job designing this new ship. I just came out of my 'dark ages', so a new pirate theme this year would be great timing! This looks promising, we'll just have to wait and see what happens. My guess is that this is an anniversary set and not a new theme (POTC 5 is still to come!) but I'm sure it will be awesome. Maybe they'll make it resemble one of the old style ships of the classic era. That would be sweet. Also, maybe if the set gets enough sales they'll end up seeing Pirates as a good opportunity to reboot, this time on a larger scale that '09. Such great news! At least one of my two prefered themes is coming back! It specifies "one of the new LEGO pirate ships sets", by that I think it means that LEGO will produce that particular set many times (like every other set) and give one of them to the winner, although I hope I'm wrong. :P If there are any issues to my point please point it out, again, I hope I'm wrong. One may hope the ship in the teaser poster is just that... a teaser! And the actual ship will not be another ship with red striped sails. That's been done enough in the world of LEGO Pirates. I don't want to complain about anything yet, as just the thought of TLG even considering something piratey is enough to make a salty old sea dog giddy as a drunken bar wench. Can't wait to see what comes of this! My thinking cap is on too ! Pirate Ship, Pirate Ship, Pirate Ship, Pirate Ship ! Whether there will be multiple sets or not, that phrase doesn't imply anything either way, as Anexcuse points out. The preceding part of the sentence even implies the opposite. They said ". . . suggestion as the name of the actual LEGO pirate ship", not ". . . suggestion as the name of one of the actual LEGO pirate ships". "Multiple different sets" isn't a valid inference; you're reading what you want into it, I'm afraid. Sounds like a fun contest; I'll have to get out the thesaurus and my nautical dictionary!